A new Census report shows that income and poverty have barely improved since the end of the recession. But even the finances of the 1 percent are worse off than than during the dotcom boom. Maybe we should think about dropping the word "recovery" from our vocabularies, at least for the time being. The Census Bureau released its annual report on income, poverty, and health insurance today and it is, by and large, a snapshot of a country in stagnation. 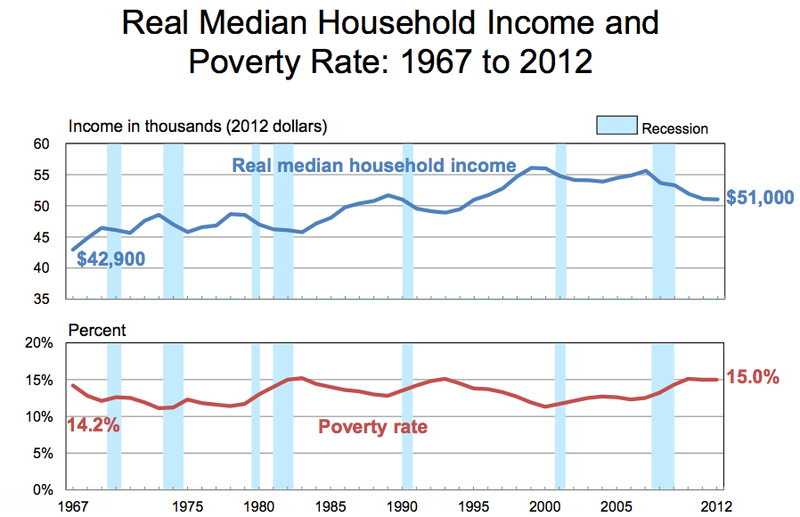 As shown on the two graphs below, median incomes didn't budge in a statistically meaningful way from 2011 to 2012. Nor did the poverty rate. About 46.5 million people continue to live beneath the threshold. Again, this is a reminder that, for perhaps the majority the country, this has been a recovery in name only. Neil Irwin notes that an American family at the exact middle of the income distribution now earns slightly less than it did in 1989, in inflation adjusted dollars, meaning they've said goodbye to 25 years of economic progress (in fairness, median incomes were at about the same place in 1996). The Economist, meanwhile, gestures to the graph below, which shows that incomes have essentially flatlined or declined slightly for everyone, rich and poor alike, since the dotcom bust. What little rebound we've enjoyed has largely benefitted the top 1 percent of households, who, according to Thomas Pikkety and Emmanuel Saez, have captured 95 percent of all income growth since 2009. But as The Economist notes, even those households aren't earning the way they did 2000. We're in a "lost decade" that, depending where you are in the economy, has now stretched on for at least 12 years. I'm not suggesting that we haven't had any progress since the recession officially ended. The housing market has started healing. Corporate profits are surging. The unemployment rate has continued to gradually fall, for both good reasons (job creation) and bad (Americans giving up on looking for work). 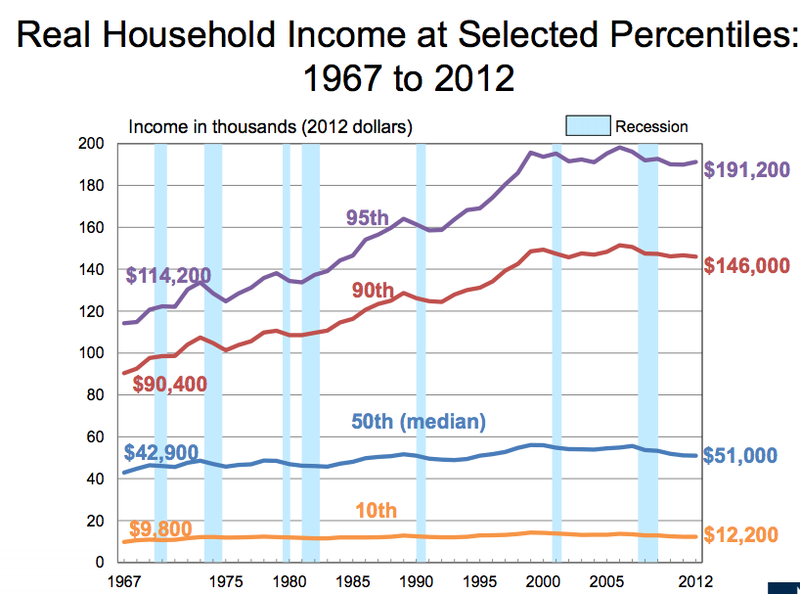 And these numbers, of course, are backward looking; maybe we'll find incomes rose and poverty declined a bit in 2013. But judging by the basic measures of whether a typical family is much better off than they were two or three or a dozen ago, it's hard to spot the progress. Jordan Weissmann is a former senior associate editor at The Atlantic.